For most of our adult lives we strive for bigger and better, especially when it comes to our homes. But when you get older, a big home can be a burden causing a lot of work and increased chances at becoming injured. Smaller spaces are easier to keep clean and clean spaces lead to improved health. Also, condos and apartments eliminate difficult stairs and keep everything within reach. "Once you are using a walker, the closer everything is the easier it is," says Elaine Frost, the owner of Trusted Transitions. "At the end of the day, I think that we fill the space we have and the more stuff we have the more complicated our lives are. The older we get the better off we are without the complications." 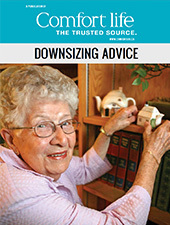 Moving to a smaller space also forces seniors to downsize, which allows their circumstances to be flexible incase any health complications require changes. But also as people get older people become most important, not stuff. "They just want to see their grandchildren more, have friends over for cards and to be with family for dinner," says Frost. Retirement communities can be ideal new homes for seniors wanting a smaller space and looking for more than just stuff. There are friends to socialize with, people around if they need assistance, activities to keep them fit and high quality meals available throughout the day. Plus, family is welcome anytime with little preparation required by the older adults.